The See by Chloe Poya Cross Body Bag is a black leather cross body bag which has a long, detachable chain and leather strap with bow detail over the shoulder. The bag is spacious with a flap over front and concealed magnetic clasp fastening. 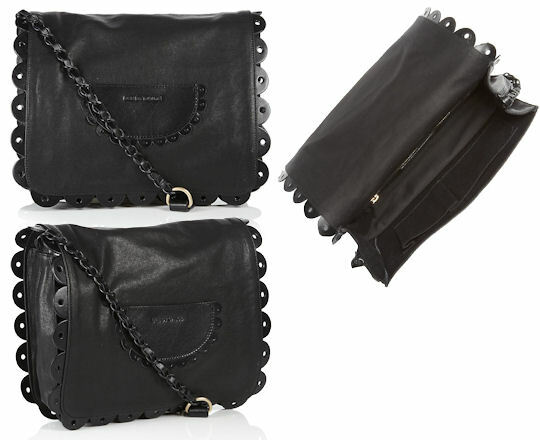 The front and reverse of the bag are trimmed in scalloped leather with punched hole detail. Inside, the bag has a black cotton lining and there is a See by Chloé brand leather label, a zip pocket and two slip pockets. Measurements: 25cm / 9.8″ x 2cm /0.8″ x 9cm /3.6″; (all measurements are approximate). It’s difficult to see from the photos, but there is a real iridescent finish to the leather on this bag which makes it look incredibly sumptuous and bang on trend for this season’s Aquatic trend. This subtle, pearlesque bag will be a fabulous way to accessorise any daywear or evening outfit as it can be worn over the shoulder or carried as an oversized clutch. The See by Chloe Poya Satchel is a soft leather flap over satchel with a feminine lacy scalloped leather trim, which has a single top handle with branded buckles and a long cross body strap. The bag has gold-tone metal hardware throughout with a branded rivet at the front, and has a central branded magnetic buckle embellished stud closure. There are a further two fixed branded buckle straps which are decorative. On the back of the bag “See by Chloé” is discretely embossed into the leather. Inside, the bag is lined in black material and there is a zip pocket and a rectangular leather See by Chloe label stitched in below. There are two further slip pockets on the opposite side of the bag. Measurements: 28cm / 11″ x 34cm /13.4″ x 17cm /6.8″; (all measurements are approximate). 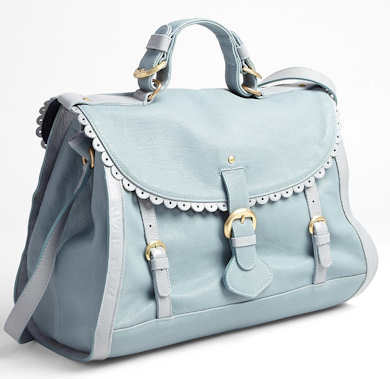 Style note: This is a flirty and feminine satchel from See by Chloé which was originally introduced for the 2011 season and has now been reintroduced for the 2012 season due to deamnd. With its pretty trim and shiny gold hardware, this stylish handbag has all the qualities of a chic, daily use handbag. Team with tailored city slicker suits to give them a more feminine edge, or wear with jeans and t-shirts to smarten up the most basic of outfits. 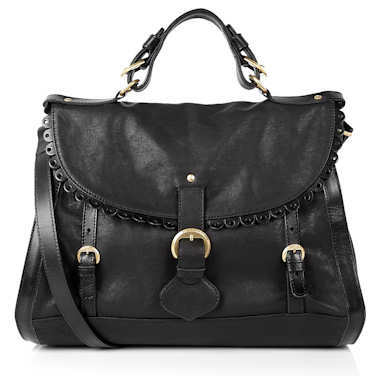 The See by Chloé Poya bag is satchel bag made from buttersoft black leather. The bag has a single top handle and a separate leather cross body strap. 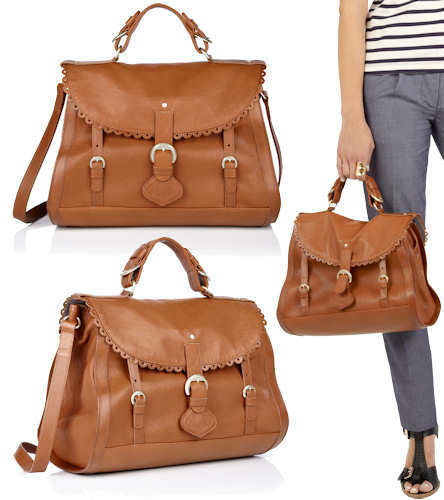 This handbag is a flapover style, and the flapover has a lacy looking leather trim. It has a magnetic fastening. All the hardware on the bag is gold in colour, including the branded buckles on the front of the bag and the rivet in the centre front of the bag which is embossed with the initials SBC. Inside, the bag has a black cotton lining and there is a zipped pocket and two pouch pockets. Measurements: 28cm / 11″ x 34cm /13.4″ x 17cm /6.7″; (all measurements are approximate). Style note: Grab yourself some enviable Parisien style with this feminine handbag from the House of Chloé. It is a chic and attractive handbag with girly decoration, yet it is a spacious bag and nice and wide at the base. It could be used for both work and play, and it would add a luxe finishing touch to your outfits. This bag was originally released for the 2011 season and now has been updated for 2012.